Target.com has some nice extra savings on select home items online only thru Monday, February 18th. There are several sales going on with discounts of up to 25%, plus you can save an extra 15% Off Curtains, Indoor & Outdoor Rugs & furniture with the code HOME thru 2/18. If you prefer to shop in stores, Target also has some nice sales in stores. 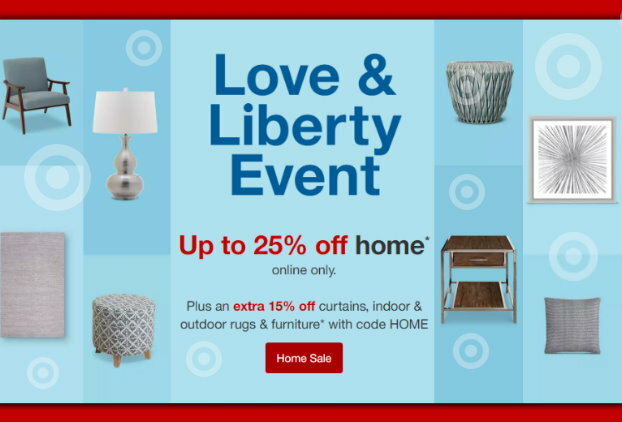 You will also need to clip the in-ad Target coupon for 15% Off an Indoor/Outdoor Furniture & Rugs Purchase thru 2/18 from the 2-10 Target ad, or you can find this same coupon in the Target app.